What are the requirements of the plugin? You need at least WordPress 3.8 running on your self-hosted WordPress installation AND PHP in a version greater than 5.3. If you don’t know how to update your PHP version, check this quick blog post for a start: How to update to the latest PHP version for WordPress. How does it protect the users privacy? Which social media icons are included? In version 1.0 there is included: Facebook, Twitter, Pinterest, Google+, LinkedIn, XING, Tumblr, renren, weibo and gittip. You can make your own buttons, too. Just upload your own image and that’s it! Can I create new icons? Now add a name, an image, etc. and save your settings. That’s it! Can I resort the buttons? Click the “Social Buttons” link from the menu. You now see an overview of all buttons. Click the “Edit” button on mouse over and then click “Quick Edit” like this. Can I deactivate some buttons? What are the Filter Hooks that I can use? Use this filter if you want to filter the posts. Has one parameter: an array of objects (what get_posts()) returns. Use this filter if you want to skip the “is-button-active” check. If the filter returns true the plugin always shows the social icons. Has one parameter: (bool) $val_to_return (Standard is null). Use this filter if you want to change the URL to the font CSS file. Has one parameter: (string) $css_file_url. Standard Value is the URL to the font file: http://your-domain/wp-content/plugins/fixed-wp-social-share/assets/css/wpbfsb-frontend-icons.css. Allows to register more custom font files. Has one parameter: (array) $icon_font_css_files. You can manipulate this example WordPress plugin. Allows to set the Arguments for the get_post_types()-call. Allows to manipulate the HTML code of each button. Has two parameters: (string) $button_html and (WP_Post) $button object. Why do some icons show the number of shares/likes/etc. and some not? This is because not every social media network provides a services to retrieve the number of shares/likes/etc. The number also does not show up when there are no shares. It seems that my site is very slow after installing this plugin. What’s wrong? After installing the plugin, it tries to retrieve the number of social shares from all the social media platforms that are active. This slows down your site but only for one page view because this data then gets cached internally. If you don’t want that the plugin retrieves the number of social shares, just go to “Settings” -> “Fixed Social Share” and uncheck the option “Display shares”. In this case the plugin never retrieves any data. You can also set how often WordPress should ping the social media service to ask for a new number of shares. For this just go to “Settings” -> “Fixed Social Share” -> “Settings” and set the “Refresh rate” to something that fit your needs. Please note that, if a caching plugin is active and if it is very aggressive, the number of shares will not be updated until the cache has been flushed manually or automatically. What is schema.org and why is it important? It seems that the number of shares never gets updated. What’s the problem? Possibility 1: Do you have a caching plugin (like WP-Super Cache, Cachify, etc.)? If yes, try to flush the cache of this plugin. Click onto the “Settings” tab. Scroll down to the “Ping Service” metabox . Click the “Flush Cache now” button and try to reload your page again. By the way: You can set the value of the “Refresh rate / Cache” to something lower if you want the plugin to grab fresh data more often. Select/Edit the button which numbers don’t appear on the frontend side. On the Button-Edit-Screen scroll down to the “Threshold” field. Set the number to something lower or to 0. Possibility 4: Note that the “Fixed Social Share” plugin can only grab the number of shares of the following social networks: Twitter, Google+ and Facebook. Other platforms do not offer an API to grab that data. Possiblity 5: Check if a certain URL has really been shared on a social network (so if there are any shares yet). How can I install and configure the plugin? Can I choose which buttons to show? Yes. 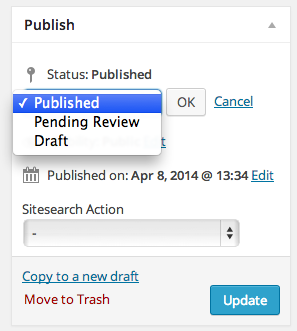 You just have to set the status of a post to “draft” or “pending review”. That’s it. You don’t neccessarily have to delete the whole button. How can I add new font-icons? Since 1.3.0 it’s possible to add more font-icons, too. Check out this example WordPress plugin that extends the icons with an Instagram, Github and Delicious icon. The example shows how to use the custom filters in this plugin to add new icons. How can I add a print-link? Click the “Social Buttons” link from the menu in the WordPress admin. Enter a name like “Print”, choose or upload an icon. That’s it. The link will now open a “Print” window in the browser. Note: This will not process the page in the way that it “looks good” on the print output. This is a job for the theme. How can I get the Twitter-Share-Button to work on mobile devices? Navigate to the “Social Buttons” menu. Then edit the twitter button. On the edit screen scroll down to the “onClick Event” field. How can I remove the arrow? First Option (recommended): Go to your WordPress “Dashboard” -> “Social Buttons”. Then set all buttons that you don’t need to “draft”. After that go to “Settings” -> “Fixed Social Share” an move the “Icon Quantity” to the maximum value. How can I add an E-Mail-Link? Click the “Social Buttons” link from the menu in the WordPress Dashboard. Enter a name like “E-Mail”, choose or upload an icon. That’s it. The link will now open an “E-Mail” window (only when E-Mail has been configured in your Browser and/or your operating system).